Go to original pattern for design DROPS 160-11. Knitted DROPS top in garter st in 2 strands ”Cotton Viscose”. Size: S - XXXL. 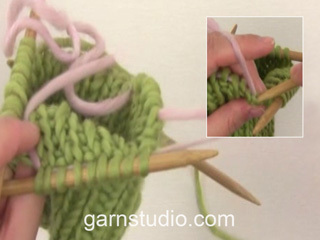 DROPS DOUBLE POINTED NEEDLES AND CIRCULAR NEEDLE (60 or 80 cm) SIZE 5.5 mm - or size needed to get 16 sts x 28 rows in garter st with 2 strands = 10 x 10 cm. 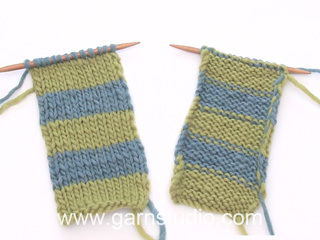 Worked back and forth in GARTER ST and STRIPES - Read explanation above. Cast on 66-72-78-86-96-106 sts on circular needle size 5.5 mm with 2 strands Cotton Viscose (off white + off white). Work in garter st. When piece measures 6 cm, cast on 1 edge st in each side = 68-74-80-88-98-108 sts. When piece measures 8 cm, dec 1 st in each side, repeat dec every 8-8-8-9-9-9 cm a total of 3 times = 60-66-72-80-90-100 sts. 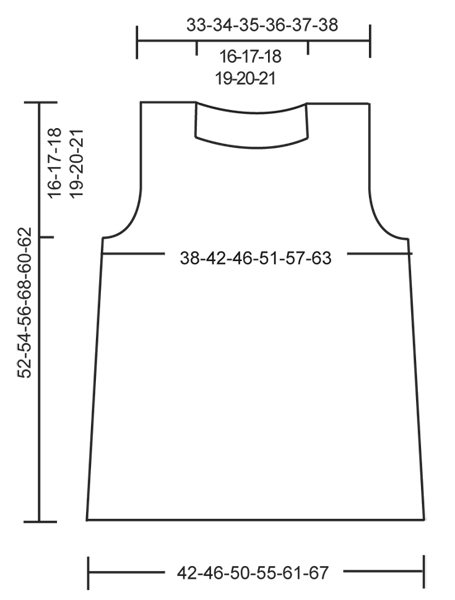 When piece measures 36-37-38-39-40-41 cm, cast off for armholes every other row in each side as follows: 3 sts 1 time, 2 sts 0-1-2-3-4-6 times and 1 st 1-1-1-2-4-4 times = 52-54-56-58-60-62 sts. When piece measures 50-52-54-56-58-60 cm, cast off the middle 24-26-26-28-30-32 sts for neck and finish each shoulder separately. On next row dec 1 st towards the neck = 13-13-14-14-14-14 sts remain on each shoulder. Cast off when piece measures 52-54-56-58-60-62 cm (stripes should now be done). Cast on and work as back piece until piece measures 46-48-50-52-52-54 cm = 52-54-56-58-60-62 sts. 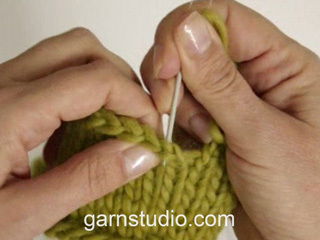 Now slip the middle 18-20-20-22-24-26 sts on a stitch holder for neck and finish each shoulder separately. Continue dec for neck every other row: 2 sts 1 time, 1 st 2 times = 13-13-14-14-14-14 sts remain on shoulder. Cast off when piece measures 52-54-56-58-60-62 cm. Sew the side seam tog inside 1 edge st. Bottom 6 cm = vent. Sew shoulder seams. Pick up approx. 68-84 sts (incl sts on stitch holder) on circular needle size 5.5 mm with 2 strands lilac. Work 2 ridges. Cast off.